Strawberry Banana Smoothie can be prepared easily from scratch without yogurt! I love this pink fruity smoothie recipe because it’s vegan and makes me feel better about myself. 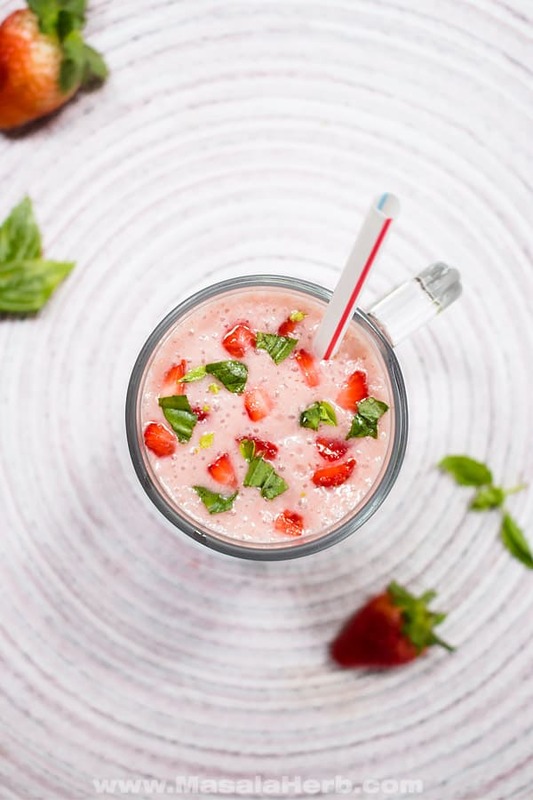 Kind of like a conscious cleanser to start the day the right way with a tasty, healthy and easy strawberry smoothie breakfast! Read more further below and get the how to make a strawberry smoothie recipe card to print. When you eat regular comfort food, you eat yourself happy. Right? With healthy and nutritious food the satisfaction works differently. Healthy food and beverages, such as a fruity strawberry banana smoothie, homemade protein bars or the Bircher Müsli, give you a chance to make yourself feel good in the morning. All this without much effort if done correctly! It’s usually easier said than done because let’s face it, we love savory brunch crepes, sweet pancakes, and fluffy waffles. Can you relate? The only way to remedy this, to cheat your own laziness, is to take a step towards change. With that, I mean to tackle your weakness for comfort breakfast food by giving you reasons to have a healthy balanced morning diet. My breakfast needs to be tasty and have flavor. No compromise here! My breakfast needs to be not only healthy but also nutritious. I want to feel full! My breakfast needs to come together quickly and without much hassle. Time and effort factor! My breakfast needs to be prepared with seasonal produce. Now this one depends heavily on my location in this world. For example, Strawberries might be in season right now in Goa but not somewhere in Europe. Plus point, if it’s Vegan and raw as it gives me the feeling that I am taking in the most of plant-based nutrition possible. This has a high psychological effect too which supports my mental well being! To achieve all those breakfast checkpoints, I try to tweak recipes and prepare something like a fruit salad, müsli bowl, smoothie or similar. One of my all-time favorite smoothies is the healthy Strawberry Smoothie Recipe without Yogurt. Do you wonder how to make an easy strawberry smoothie? I prepare it without yogurt and milk because I have a great substitute for milk and yogurt. I use coconut or almond milk and that is just rocking it! Besides that, the healthy Strawberry Banana Smoothie recipe includes locally grown bananas and strawberries from the market. I try to use as often as possible homemade DIY coconut milk for the extra flavor kick. When I am in Europe I use the common fair trade versions of Chiquita bananas, which are of course not seasonal at all. Let’s just face it, bananas are not a local ingredient in Europe. Yet Strawberries can be found in different variations. My favorite strawberries are the small forest strawberries, those are very intense and flavorful and quite popular amongst locals too in the Austrian Alps. What do you like to add to your easy strawberry smoothie? How to make Strawberry Banana Smoothie without Yogurt? To prepare a fresh healthy Strawberry Smoothie Recipe without Yogurt you will only need a few ingredients, ice cubes, and a good blender. I recommend getting a quality blender with a good engine such as the Ninja Blender. 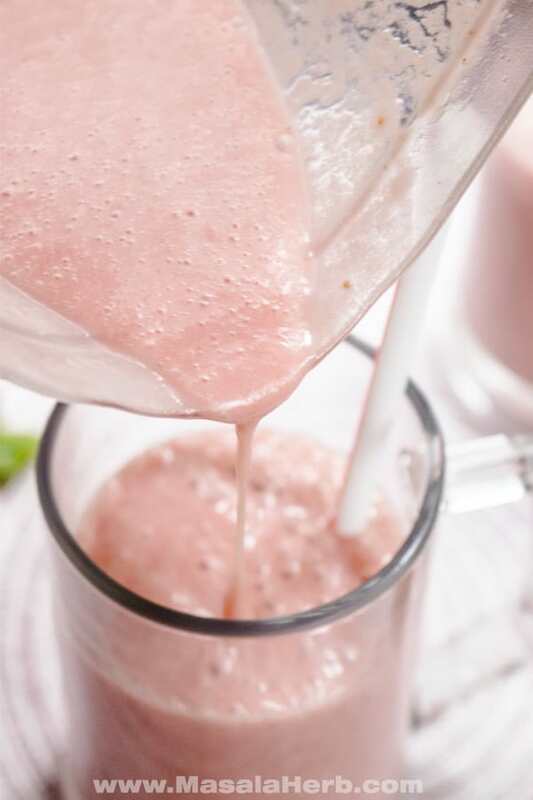 I have tried making this simple strawberry smoothie with a cheap blender and it was always a huge disappointment (or a mess!). Either the easy strawberry smoothie wasn’t smooth (beats the purpose!) or the engine would heat up and render the blender useless. Banana is known as a feel-good ingredient. It’s a nutritious fruit, which signals your stomach that you are satisfied and in turn keeps you full longer. In that sense, the banana makes sure that you don’t go overboard by eating food without nutritious values a short time later. Banana also helps in thickening the easy strawberry smoothie! Strawberries provide a good dose of balanced vitamins and minerals. Plus point, they taste great too and turn the smoothie into a lovely pink color. After all, we eat with our eyes too, don’t you think? Coconut milk is very nutritious too and high in healthy fats which are needed to keep you longer full. This is the same concept as the banana, to signal your brain that you don’t need to eat so soon again. The healthy fats in coconut milk are essential for those who want to maintain a better muscle vs body fat ratio since healthy fats are needed to “feed” the formation of muscle cells. If you prefer a lighter vegan and raw milk, then try to use almond milk instead. The ice cubes are essential for a thick and creamy strawberry banana smoothie without yogurt. You just need to blend the ice cubes along with the strawberry banana and coconut milk, that’s it! No extra work involved. Besides the ice makes the smoothie really cool. I just love the coolness and it helps me to wake up! In fact, the preparation of a simple Strawberry Smoothie Recipe without Yogurt should won’t take you more than 5 minutes! You may garnish the smoothie with some mint if you are serving this to a family or friend. After all, we should be able to share the good things in life and the pink strawberry banana smoothie is one of those good things in life. 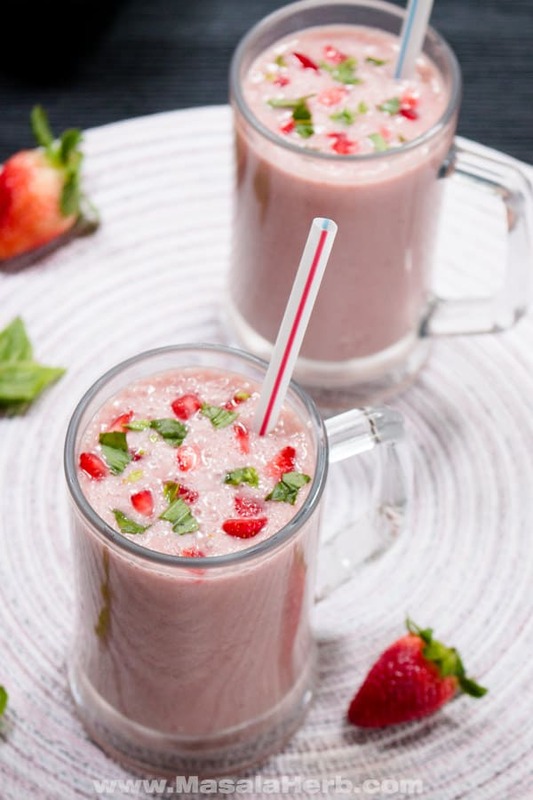 Delicious and healthy fresh strawberry banana smoothie without yogurt BUT with coconut milk. Only with raw ingredients, thick and creamy and absolutely addictive! My new favorite breakfast smoothie. 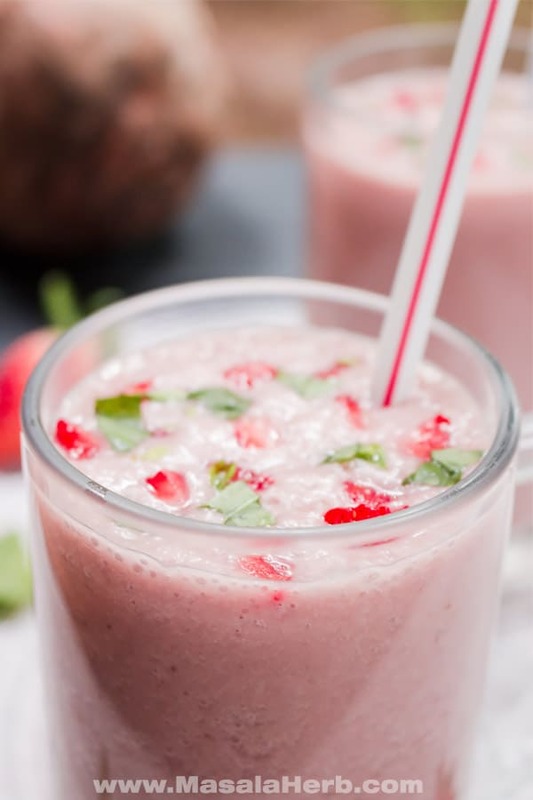 Takes about 5 minutes make this from scratch easily simple with a good blender (see suggestion in the post) and the banana strawberry smoothie will help you wake up instantly with its smooth comforting flavors and coolness. Nutritious breakfast to keep you going the whole morning! Peel your bananas and place into the blender jar together with the cleaned strawberries (greens removed), coconut milk and the full ice cubes. Blend to a smooth consistency so that no chunks are left and the result is a thick ice cold creamy strawberry banana smoothie. You may garnish it with some fresh Peppermint or Basil leaf. I used some refreshing Asian (Indian) Tulsi Basil in the pictures. Dear Reader, What’s your breakfast routine? Please share with us your breakfast routine and thoughts in a comment further below this post! I love smoothies for breakfast. They are so easy to make and the best thing is that you can take them with you if in hurry! This flavor combo is delicious – love strawberries and bananas together. My daughter is a big smoothie fanatic — I think it has something to do with a Jamba Juice on the corner. This one sounds a lot healthier than the concoctions they serve! This recipe looks easy and delicious. I usually make my smoothies with yogurt but love the idea of using coconut milk. That adds a great tropical taste as well. Yum. This would make a delicious start to any day! I love to serve smoothies for breakfast in the summer! I’m not a huge smoothie lover, I prefer to eat my fruits and veggies, but if you need a quick To Go breakfast, they are difficult to beat! Have you tried freezing the bananas? They blend into a smooth thick texture that is similar to a creamy milkshake! 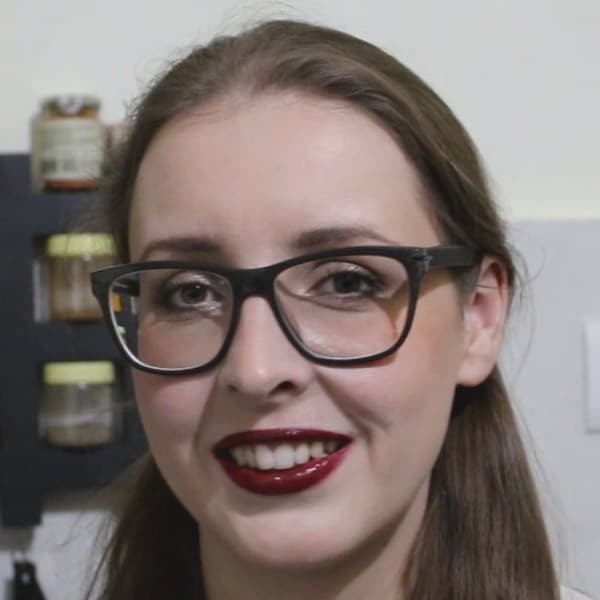 My breakfast is usually 3 hard boiled egg whites with 1/4 avocado and 15 mL salsa, camomile tea followed by a delicious decaffeinated café au lait! Hi, this may be interesting you: Healthy Strawberry Banana Smoothie!